Steffen: How did Glen More Icome about? Matthias: My first game was Kraftwagen. I worked on it for a long time, also because I was a beginner. I didn’t really get anywhere with that, but I liked the mechanism of the tile roundel, it’s the same as in Glen More I, so I just wanted to put it in a different context. Let’s build villages, let’s build landscapes. Then I came to Highlands and developed new mechanics because I needed resources and trade between the players. Glen More I was created within 3 to 4 months. S: What was easier with Glen More compared to cars? M: It’s not really easier, I was just lucky the theme was right. From the tiles came the raw materials, then the market came and so one thing came to another. It developed bit by bit. Sometimes the puzzle pieces just fit together. S: 3 to 4 months is of course sporty. 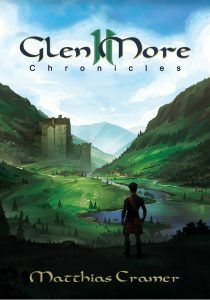 How long do you sit on Glen More II: Chronicles? M: I’ve been sitting on Glen More II: Chronicles for 3 years. And I’ve been sitting on it for so long because I wanted to sit on it for so long. Glen More I has a few things that I thought in retrospect: “If I’d spent more time on it. And that’s why I said to myself, I got the license back, I can do something with it now and now I want to take the time for it. That was also the original motivation to start this project. S: If you say there were things that didn’t inspire you so much after the first one, what were they and how will they be done in the future at Glen More II: Chronicles? M: What bothered me was that there wasn’t really a strategy where I could get by with a few tiles. I’ve had at most a second place with it, but never a first. There wasn’t supposed to be a little plate killer strategy either, but I wanted to take it into the possibilities. Of course, you still have to do something and have a concept, but now you can be at the front with just a few tiles. The second thing that was important to me was the end of the game. I found that unsatisfactory. Because anyone who could calculate when the final tile would appear had an advantage over someone who just couldn’t. And that’s why I wanted to make the end of the game easier. Also the variability. 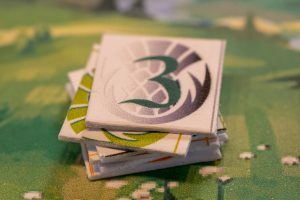 Glen More always has the same tile set, the same thing always happens and that was also a big reason for the new Chronicles. It was important to me that you could have different game experiences with the same game. 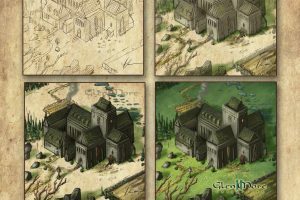 M: Also the basic game of Glen More II: Chronicles is more diversified. That’s partly because there’s one scoring category more. So you can focus more on one or the other and switch to other options when strategies fail. S: Strategy with few tiles. 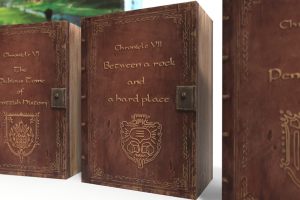 How does that work in Glen More II: Chronicles now, what have you changed? 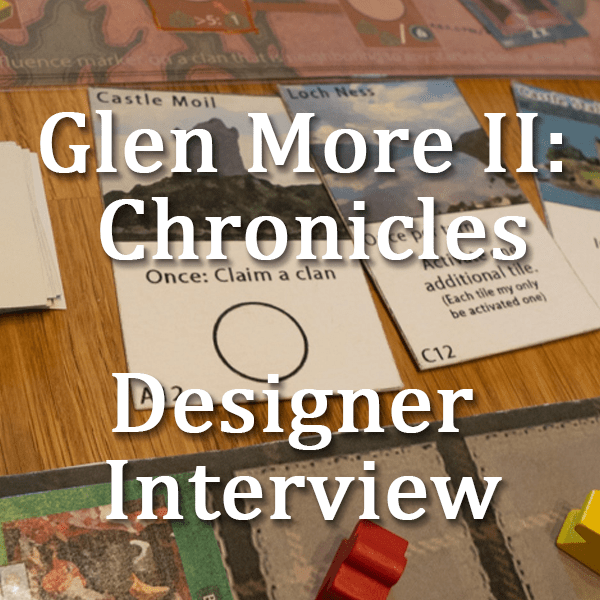 M: There are two new tile types in Glen More II: Chronicles that you can’t find in Glen More I. One is superstructures, which means I can superstructure certain parts and make a move without getting another tile. The second effect is that I can build right in the middle of my landscape. So if I build a tile in the middle, I can do a great activation because there are already seven or eight tiles around it. So that also prevents you from collecting those dead tiles over time, if you’ve already built a few turns and you wouldn’t be able to get them otherwise with activations. S: What happens to resources that are on the tile you are building over? M: They remain on the tile. They are moving up, so to speak. The second thing I changed is the new score: The person cards. So there are famous persons who are then well-disposed towards my clan. I have to pay gold for them, but I get a special clan bonus. There’s also a clan board that lists the different clans. In the beginning these are more things that help me to build the landscape, like resources or a barrel of whisky. But towards the middle and end of the game it can also be things that give me a permanent ability so that I can do something special that only I can do, or towards the end of the game it can give me victory points for something like the length of my river. S: You said that persons are a category of their own. But the scoring works basically like Glen More I? So always in comparison to the other player who has the least in the category? M: Exactly, we score the sights, the whisky, the meeple – only that you don’t put them out anymore, but gather them in the Clancastle. This is easier handling and raises fewer rule questions. And the fourth thing we do is score the persons. These are tiles, there are portraits of people on them and I collect them next to my landscape. S: Does that mean that there will be a major change in the scoring? M: Exactly, the Bonnets don’t exist anymore, instead the meeple are pulled into the Castle. So it has become easier. The scoring principle has remained the same. S: Making Scotsman points has become easier because they stay on the board. You don’t have to decide to drop them anymore. S: Does that remove tension? M: I can’t shoot myself down so easily anymore, which is also more beginner-friendly. And I can tactile back and forth. I can pull them into the Clancastle for one round and if I have enough steps, I can pull them out again. So I can still change my mind and correct my decisions. M: You go hiking or go by boat. (laughs) I talked to the British Tourist Office for three hours and they said you can’t call the Scottish roads real anyway. If you’ve been there before, you know that. S: By the way, there is also a traffic council in the town of Glen More, where I was on the website a few days ago. They might be interested in what you say. Of course it’s all under your name when I give it out. So, the street is gone, why? M: She just limited too much at the end. I wanted to have the building a little more flexible. And since, depending on the Chronicle, we have some new sights, which also require certain resources and if I can still get around the corner with the river and the street, then that just restricts people too much and there were turns in which people have to jump forward because otherwise they can’t take anything else and I just didn’t want that anymore. S: The persons sound especially exciting because they don’t only bring in the new score but also the clanboard. You’ve already told a bit, but I’d like to hear something about it. What is the background, how did it come to the clanboard? What do the players do with it and what do you want to achieve with it? M: The clanboard came a bit out of the fact that I like maps. I also wanted to see a bit of the Highlands. And if you read through Scottish history you will always find these clan areas where which clan was located. And because the persons are of course important personalities from Scottish history – it starts with Braveheart and ends with Sir Arthur Conan Doyle – I first assigned them to different clans to connect the abilities and give the people such a tectonic in their hands. That they also have to look a little bit there, okay, where do I start, which way do I go there and what is connected with that. And of course there’s room for tactics here. S: Does that mean that it’s more a tactical decision for the players or are there also strategic decisions?